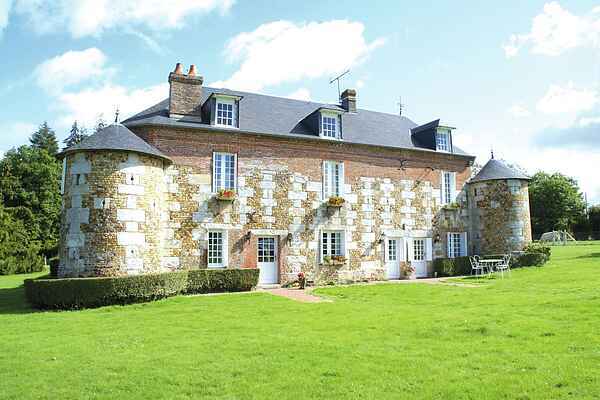 This elegant, restored 15th-century vacation home is located 1 km from the village of Trinité-de-Réville. The house is in the right wing, with the cute little tower where the original stairway is still present. The house is located in among well-kept grounds. In the garden you will only hear the birds singing or the lowing cows that graze in the adjacent pasture. On the lawn there is enough room for the children to play some ball. A pleasant environment to rest after a day trip in this special region. Then just fire up the BBQ for dinner and you can continue enjoying! For some water fun, there's a small stream close to the holiday home (500 m) where the kids can enjoy themselves building dams. Bernay (14 km) has a swimming pool and you can go fishing. The forest (20 ha) starts close to the house and is a fantastic location for beautiful walks. But the hilly surroundings can also be explored equally well by bike. Fancy a day at the beach? The fashionable resort of Deauville (60 km) is definitely worth it!